Nancy Ward was spared the sight of her people's exile to Indian Territory in 1838, but because her spirit was present at Chota, they knew she had preserved that connection to their eastern home. The role of Ghighua, or Beloved Woman, among the Cherokee was an influential one indeed. The most noted of the Cherokee Beloved Women was Nancy Ward, or Nan'yehi. Closely related to such leaders as Old Hop, the emperor of the Cherokee nation in the 1750s, Attakullakulla, the Wise Councillor of the Cherokee, and Osconostato, the Great Warrior of the Cherokee nation, Ward won the honored title of Ghighua and her own leadership position after displaying great bravery in battle. But Ward was not merely a warrior. She spoke on behalf of her people with U.S. representatives and wisely counseled the tribe against land cession. She did not live to see her warnings become reality as the Cherokee were dispossessed of their eastern lands. Born about 1738 at Chota, a "Peace Town" or "Mother Town" in the Overhill region of the Cherokee Nation, Ward came into the world at the beginning of a crucial era in Cherokee history. Raised by her mother, Tame Deer, and her father, Fivekiller (who was also part Delaware or Lenni Lenap‚), Nan'yehi realized at a young age that her people were in turmoil. Missionaries, Moravians (Christians who seek to persuade others to accept their religion and follow the Bible as their rule of faith and morals) in particular, were trying to gain access to the Cherokee people in order to convert them. Still very conservative (resistant to change), preserving their traditional customs and religion, the Cherokees had a mixed reaction to the missionaries. Many regarded them as a threat, others saw them as a blessing. One of those who straddled this fence was Nan'yehi's very influential maternal uncle, Attakullakulla ("Little Carpenter"). He eventually struck a deal allowing Moravians into Cherokee territory, but only if they would build schools to instruct Cherokee youth in English and the ways of the white man. Later critics would see this as evidence of Attakullakulla's desire for the Cherokee to accept European ways; others saw this as a tactic to teach the tribe more about their enemy. Like her uncle, Nan'yehi too would try to find the middle ground between tradition and innovation. Ward married a Cherokee man named Kingfisher while in her early teens. Kingfisher was a great warrior, and Nan'yehi was at his side in battle, helping prepare his firearms and rallying Cherokee warriors when their spirits flagged. In 1755, the Cherokees fought the Creeks at the Battle of Taliwa. During the fighting, Kingfisher was killed. Nan'yehi, about 18 years old at this time, took up her slain husband's gun and, singing a war song, led the Cherokees in a rout of the enemy. Out of her loss was born a decisive victory for her people and a title of honor for her: "Beloved Woman." The Cherokee were a matrilineal (tracing family relations through the mother) society, and thus their fields had always been controlled by women. Women of great influence became known as Beloved Women, often working behind the scenes in shaping decisions. 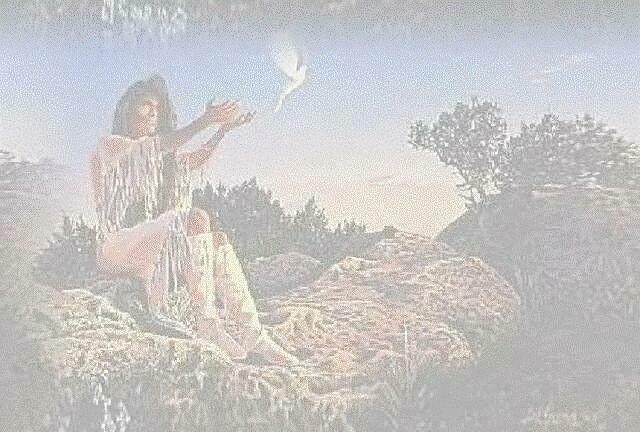 The role of Ghigau or Beloved Woman was the highest one to which a Cherokee woman could aspire. It was unusual for one as young as Nan'yehi to be so named, but since the name also translates as "War Woman" and was usually awarded to women warriors (or warriors' mothers or widows), Nan'yehi had duly earned it. Much responsibility went with the many privileges of the rank, and, although young, Nan'yehi showed herself capable. Among the privileges accorded Nan'yehi as a Beloved Woman were voice and vote in General Council, leadership of the Women's Council, the honor of preparing the Black Drink — a tea used in ceremonies to purify — and giving it to warriors before battle, and the right to save a prisoner already condemned to execution. Nan'yehi would exercise all these rights and would serve as her people's sage (wise person) and guide. Another of the Beloved Woman's duties was as ambassador, or peace negotiator. It is through this role that Ward became a figure in non-Cherokee history. Ward, who had been "apprenticed" as a diplomat at her uncle's side, was a shrewd negotiator who took a realistic view of how to help the Cherokee people survive. She had grown up during a time when continued white settlement on Cherokee lands, in violation of the Royal Proclamation of 1763, in which the British Empire had recognized the rights of Native people, created constant tension in Indian-white relations. When militant Cherokees prepared to attack illegal white communities on the Watauga River, Ward disapproved of intentionally taking civilian lives. She was able to warn several of the Watauga settlements in time for them to defend themselves or flee. One of the settlers unfortunate enough to be taken alive by the Cherokee warriors was a woman named Mrs. Bean. The captive was sentenced to execution and was actually being tied to a stake when Ward exercised her right to spare condemned captives. Taking the injured Mrs. Bean into her own home to nurse her back to health, Ward learned two skills from her which would have far-reaching consequences for her people. Mrs. Bean, like most "settler women," wove her own cloth. At this time, the Cherokee were wearing a combination of traditional hide (animal skin) clothing and loomed cloth purchased from traders. Cherokee people had rough-woven hemp clothing, but it was not as comfortable as clothing made from linen, cotton, or wool. Mrs. Bean taught Ward how to set up a loom, spin thread or yarn, and weave cloth. This skill would make the Cherokee people less dependent on traders, but it also Europeanized the Cherokee in terms of gender roles. Women came to be expected to do the weaving and house chores; as men became farmers in the changing society, women became "housewives." Another aspect of Cherokee life that changed when Ward saved the life of Mrs. Bean was that of raising animals. The white woman owned dairy cattle, which she took to Ward's house. Ward learned to prepare and use dairy foods, which provided some nourishment even when hunting was bad. However, because of Ward's introduction of dairy farming to the Cherokee, they would begin to amass large herds and farms, which required even more manual labor. From these accommodations to European-based ways of life, one might get the idea that Ward was selling out the Cherokee people. But her political efforts proved the contrary. She did not seek war, but neither did she counsel peace when she felt compromise would hurt her tribe. In 1781 Ward entered into peace talks with Tennessee politician and soldier John Sevier at the Little Pigeon River in present-day Tennessee, she had called for peace but warned Sevier to take the treaty back to "his women" for them to ratify. It did not occur to the Cherokee that women did not decide matters of war and peace in the white man's world, as they did in many southeastern tribes. Ward was also a negotiator for the Cherokee at the 1785 signing of the Treaty of Hopewell, the first treaty the Cherokee made with the "new" United States. By the turn of the nineteenth century, it was already becoming apparent to the Cherokee that the Americans intended to get as much Cherokee land as possible and that the day might come when the Natives would be forced off their homelands. Ward, by now called "Nancy" by the many non-Indians she had befriended, feared that each time the Cherokee voluntarily handed over land, they were encouraging the settlers' appetite for it. She feared that someday their hunger for land would destroy her people. In 1808, the Women's Council, with Ward at its head, made a statement to the Cherokee people urging them to sell no more land. Again, in 1817, when Ward took her seat in council, her desperation was ill concealed. She told the younger people to refuse any more requests for land or to take up arms against the "Americans" if necessary. When she became too aged to make the effort to attend further General Council meetings, Ward sent her walking stick in her place thereafter. Some contemporary sources say she "resigned" her position as Beloved Woman with this action, but the mere absence from council did not indicate the end of her term. Ward was well aware that Cherokee "removal" west of the Mississippi River was almost a foregone conclusion. Rather than face the sorrow of leaving her homeland, she decided to find a way to blend in to the white world. Nan'yehi had become Nancy Ward when she married the Irish (or Scots-Irish) trader Bryant Ward. By now, her three children were grown, so she was accorded the indulgence of "modern conveniences" because of her advanced age and the great integrity with which she had long discharged her duty to her people. Therefore, when she and Ward took to the innkeeping trade, there was no disrespect voiced toward the Beloved Woman. Their inn was situated near the Mother Town of Chota, on Womankiller Ford of the Ocowee River, in eastern Tennessee. Ward returned to Chota, her birthplace, in 1824. She was cared for by her son, Fivekiller, who reported seeing a white light leave her body as she died. The light was said to have entered the most sacred mound in the Mother Town. Ward was spared the sight of her people's exile to Indian Territory in 1838, but because her spirit was present at Chota, they knew she had preserved that connection to their eastern home. The last woman to be given the title of Beloved Woman until the late 1980s, Ward remains a powerful symbol for Cherokee women. She is often referred to by feminist scholars as an inspiration and is revered by the Cherokee people of Oklahoma as well as the Eastern Band Cherokees of North Carolina.